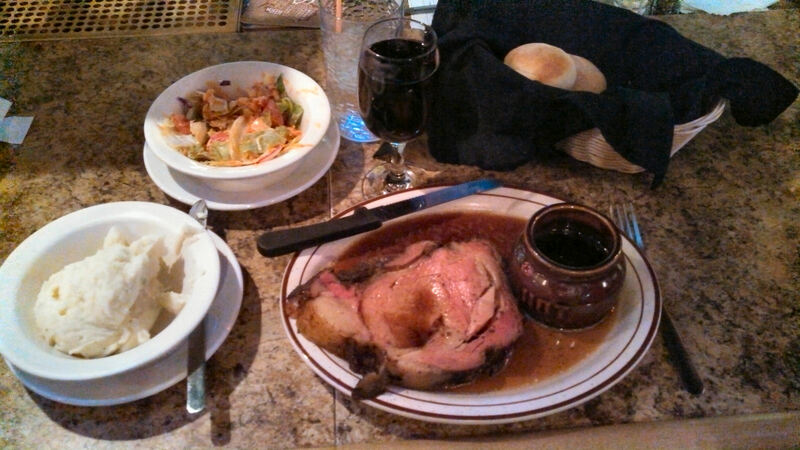 Anglers Bar and Grill on Main Street, has always been one of my favorite places to eat, especially during my workdays in Hayward, but they recently added prime rib to their Saturday night menu so I had to venture downtown to try it out. WOW is how I have to start out! I love prime rib and have tried it at many places up in the Hayward area, all of which were good, but Anglers Prime Rib was beyond spectacular. Both cuts were under $20 and included choice of potato, soup or salad, and rolls. I ordered the smaller queen cut, medium rare, and it was mouthwatering. Perfectly seasoned and tender, in fact I could of eaten it without the tasty au jus that comes with it – it melts in your mouth. Brian Fuller, one of the owners, previously explained to me that they attribute the tenderness to their cook’s expertise, but also that they order a superior cut of prime rib to begin with. I deviated from my normal choice of baked potato and tried the garlic mashed potato – well who doesn’t like mashed potatoes? These were very good, fresh-tasting with just a hint of garlic, a definite ‘like’ . Their soups are always very good but since I had soup at lunchtime already, I decided to order a salad with my meal. Anglers salads are always very fresh, and even their side salads are packed with goodies such as cheese, carrots, cucumbers, tomatoes and more. The warm dinner rolls complimented our food. 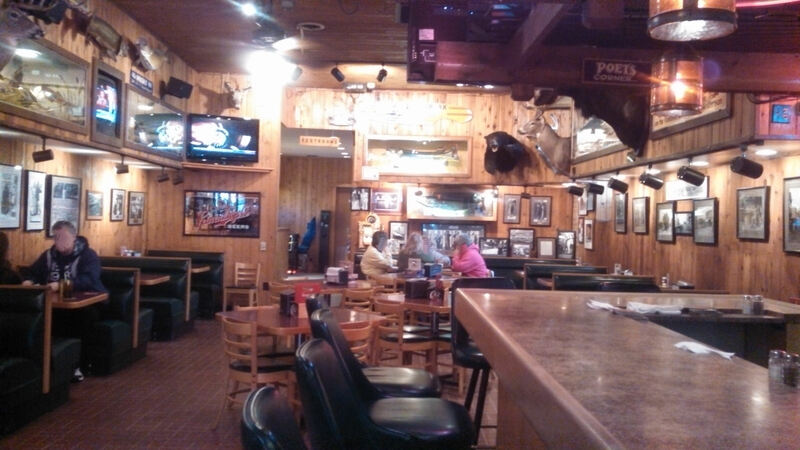 I highly recommend the prime rib at Anglers Bar & Grill if you are in the Hayward area on a Saturday night, not only is the food wonderful, it is a fun, lively place with very friendly people. After your meal, be sure to meander down Main Street to enjoy the colorful holiday lighting display ‘A Lure of Lights‘. 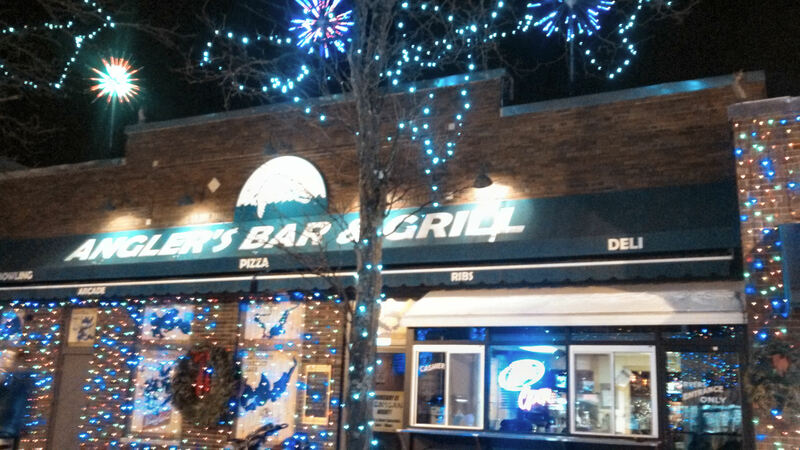 This entry was posted in Dining & Resorts Hayward Area and tagged a lure of lights hayward, Anglers Bar & Grill Hayward, Au jus, bars in Hayward, cathy lareau, Good place to eat in Hayward, Hayward, Hayward Wisconsin, Main Street, Mashed potato, Prime rib in Hayward, Salad. Bookmark the permalink.